4성급 Hotel Atlântico Copacabana는 코파카바나 해변에서 500m, 이파네마 해변에서 3km 떨어져 있습니다. 옥상 수영장에서 구세주 예수상(Christ the Redeemer)의 멋진 전망을 감상해보시기 바랍니다. 일일 무료 조식 뷔페도 즐겨보십시오. 전 구역에서 Wi-Fi도 이용 가능합니다. 케이블 TV, 전화기와 미니바를 갖춘 모든 객실은 자연색과 원목 가구로 꾸며져 있습니다. 일부 객실에는 거실과 소파도 마련되어 있습니다. TV실에서 휴식을 취하거나 로비 바에서 음료를 즐겨보시기 바랍니다. 피트니스 센터, 사우나와 마사지실 등 호텔의 부대 시설도 이용해보십시오. 인근에는 공용 자전거 스테이션이 마련되어 있습니다. Hotel Atlântico Copacabana는 시케이라캄푸스 지하철역에서 190m, 코파카바나 항구에서 2.9km, 산토스 두몽 공항에서 8.2km, 갈레앙 국제공항에서 25km 떨어져 있습니다. 전용 주차장은 선착순으로 이용이 가능하며, 추가 요금이 부과됩니다. 엑스트라 베드를 요청할 수 있으며, 가능한 경우에 한해 추가 요금으로 제공됩니다. 이 호텔은 체크인 48시간 전부터 신용카드를 사전 승인할 수 있는 권리를 보유합니다. 안전 금고 및 외부 전화 이용 시, 요금이 부과됩니다. 15R to have internet connection for the day or 50C a minute, can add up if your there 2 weeks. 6R a day to use room safe. These two things should have been free in my opinion. Door lock was a card and on the 12th floor, had to keep going back down to get it reset. Single wanted a double but got a room with two single beds. Other than paying for a few extras that should be free i have nothing bad to say about this hotel, it suited my needs perfectly(almost). Excellent location, 5 minute walk to beach, Metro on doorstep, lots of supermarkets, restuarants and bars all on the doorstep. Would definately stay again. Safe area to walk about day and night. Full of cockroaches and bugs. The AC was make a noise like tractor trailer. The bed sheets, pillow covers, and towels were full of stains and dirty. good loction.alots cfe and restaurant.nearby metro station. Nice place to stay, with friendly staff, nice though could be noisy rooms, great breakfast, high speed internet available for 15 Reals a day.. Directly opposite to metro station, close to good restaurants and shops, not a far walk to the beach.. Rooms prices going up every year..
Could not regulate the AC, at certain hours I had no hot water, the elevators are not safe, slow. The exercise equipment did not work. I enjoyed the hotel as a whole, very friendly service and the front desk was always helpful. I really liked that the metro system was right across the street. That made traveling a lot cheaper....no taxi! The beach is only a 5 minute walk with lots of great restaurants on the way. I will definitely stay there again. No cons - just don't expect top end luxury at this price. Good value considering it's location and price. Couldn't really fault anything but don't expect luxury. Don't get me wrong - a good, well-priced hotel that served as an excellent base for us. There was a separate sitting area part of the room which made it feel a bit like a 'suite' but without kitchen facilities! Felt really safe walking to, from and around the hotel both day and night although we did not venture out after midnight on any evening. Would definitely recommend this hotel for location and value for money. Rooms can be noisy. Though breakfast buffet is very good & free, the dining room can be crowded.. I have stayed at this hotel about 10 times so far, the staff is very friendly, the location is excellent though it can be noisy. The rooms are not very luxurious but more than adequate. They have high speed internet access in rooms, and wi-fi for 15 Reals a day or so. Signal not very reliable though in upper floors, or lobby. Good location across subway station, though not at the beach, but not very far. Very friendly staff. Great free breakfast. A little noisy. High speed internet connection available, but too expensive if you pay per-minute. 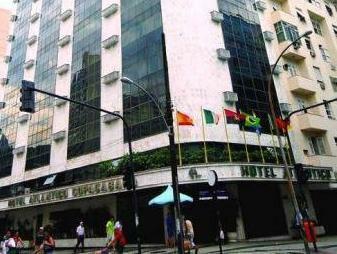 Atlantico Copacabana hotel is a very friendly place to stay at if you do not care about being directly at the beach. The staff is very friendly. The subway station is across the street. Good restaurants and shops are close-by. We liked this hotel. This hotel locates in center of Copacabana, but it is not beach front. It takes around 7 min to reach beach area. The staff was great. The room was big enough. Buffet breakfast was great. The hotel has small pool in the roof. Internet is not free, and costs 15 R for all day.I think this hotel is good for this money. The hotel is located right at the metro station and the transfer from metro to metro bus. This is very convenient for going anywhere. Hotel is about 4 blocks away from Copacabana beach. However, the area may look seedy at night. It does not feel safe like areas in Ipanema. Rooms are very old and basic, but high floors may have good views. Breakfast is basic. Service depends on mood of staff. The room given to me was small and very smelly. But the views are very good. I can even see Cristo Redentor on a clear day. Choose high floors. Breakfast is a pleasant surprise. Location is superb. It is next to opposite metro station. This station is also the interchange from metro train to metro bus. So going anywhere is very convenient. However, roads (intersection in front of the hotel) gets flooded to knee level whenever it rains but will subside after rain. big hotel 4 blocks off copacabana beach. great deal for the money. not the most luxurious hotel in copacabana but who cares for this price. rooms are big and clean. breakfast buffet will blow your mind. rooftop terrace with a pool overlooking all of rio de janeiro and right by the mountains. very nice. Friendly staff. Very close to Metro station. Great breakfast buffet..
Not directly on the beach. Not an issue for me. Rooms can be noisy due to heavy traffic on the street.. If not being directly on the beach is important to you, this is a good hotel to stay at. Very friendly staff. 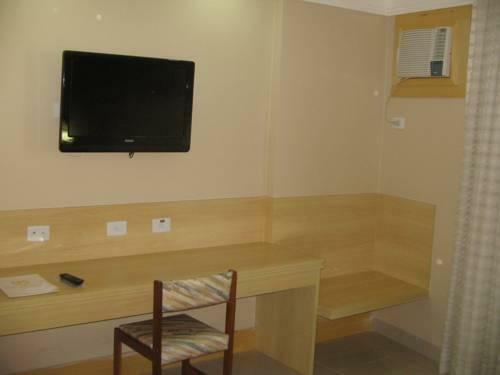 Fairly equipped spacious rooms, with high speed Internet connection (At a charge of 15 Reals per day),great free breakfast buffet and immediately opposite to Metro station. convience to local area, beach, shopping ,etc..close to subway! noisey street, traffic etc. very busy area untill late at night, ask for higher floors!!! this was not my first time in rio, i stayed at another hotel just down the street from the atlantico last year and i noticed a big difference.the staff at the atlantico was very polite and friendly.the hotel was clean, includes nice breakfast,good water pressure"something not common in brasil", also the subway was right across the street and also several good places to eat, the beach and shopping was a short walk. 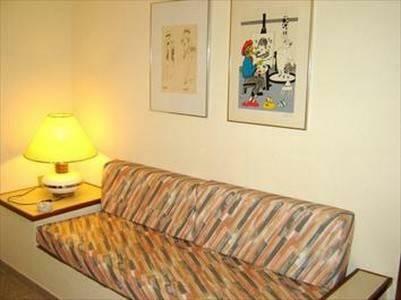 The hotel is very conveniently located - walking distance from the beach and at the intersection of very lively streets. The receptionists at the reception desk are very helpful and friendly. They offered us towels on the last day (AFTER checking out) to use at the beach. We stayed there only 2 days but due to the good suggestions from a receptionist on the first night we made the main attractions (Curcevado and the Shugar Loaf Mountain) during our one-day sightseeing. The driver offered by the hotel was also friendly but perhaps a bit more expensive than if we were to use the meter taxis. The same receptionist gave a recommendation for a good restaurant not too far from the hotel. We also liked the fact that there are many great snack and juice places right next to the hotel.